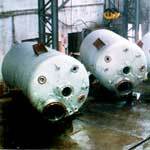 Spire Industrial Equipments Co. is one of the renowned Pressure Vessels manufacturers from India. Different types of industrial pressure vessels are easily available with us in different shapes and sizes. Spire Industrial Equipments Co. is an eminent high pressure vessels supplier. We are a professionally managed organization which is wholeheartedly engaged in the manufacturing and supplying of all sorts of industrial pressure vessels. We have considerable expertise in dealing with different types of industrial pressure vessels as well as high pressure vessels.